Hadrian's Library was created by Roman Emperor Hadrian in AD 132 on the north side of the Acropolis of Athens. The building followed a typical Roman Forum architectural style, having only one entrance with a propylon of Corinthian order, a high surrounding wall with protruding niches (oikoi, exedrae) at its long sides, an inner courtyard surrounded by columns and a decorative oblong pool in the middle. The library was on the eastern side where rolls of papyrus "books" were kept. Adjoining halls were used as reading rooms, and the corners served as lecture halls. a simple cathedral (12th century), which was the first cathedral of the city, known as Megali Panagia. Around the same period as the cathedral another church, Agios Asomatos sta Skalia, was built against the north facade, but it is not preserved. ^ Choremi-Spetsieri, A. 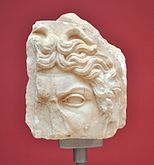 The Library of Hadrian at Athens: Recent Finds. Ostraka 4. pp. 137–147. ^ "The Library of Hadrian". The Stoa Consortium. Retrieved 2009-02-19. ^ "Library of Hadrian Description". PlanetWare. Retrieved 2009-02-19. ^ "Hadrian's Library". Athens City Guide. Retrieved 2009-02-19. This page was last edited on 7 April 2018, at 15:40 (UTC).